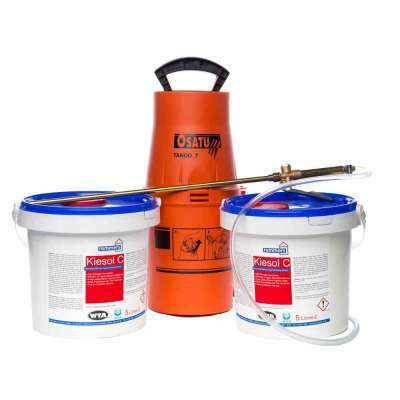 A complete Damp Proofing Injection Cream Kit featuring the highest strength damp proofing cream available! Kiesol C provides a permanent horizontal barrier against rising damp in masonry. Please Note: This kit includes 1 x 5L Kiesol C as standard. Do you require extra Kiesol C? Kiesol C is a next generation Damp Proofing Cream, providing permanent protection against rising damp. This special DPC injection kit contains the Kiesol C cream along with all you need to install a new DPC to protect against rising damp. Kiesol C is the highest strength damp proofing injection cream in the world with an active ingredient (silane) level of 80%. This is more than any other damp proofing cream on the market, providing long lasting protection against rising damp and giving the homeowner peace of mind. 5 Litres of Kiesol C will cover approximately 50 linear metres of single skin (110mm, 4.5") brick work or 25 linear metres of double skin (220mm, 9") brick work. Additional Kiesol C 5L units can be added at highly discounted prices. This high strength and high performance DPC injection cream is specially formulated to penetrate deep into the masonry. It provides a new chemical damp proof course - a permanent horizontal water repellent barrier against rising damp. 1. Kiesol C is injected into a 12mm hole drilled into the mortar joint approximately 75mm-150mm above ground level. 2. The product is then left to revert to its liquid phase and penetrate the masonry surrounding the hole. 3. As Kiesol C penetrates the substrate, it carries the high level of active ingredients into the masonry. These silanes line the capillaries in the substrate to create a water repellent barrier. Kiesol C has been approved by the German WTA for the treatment of rising damp in highly saturated walls with a moisture saturation level of up to 95%. The WTA test method is particularly tough on the product because the test walls are subjected to continual damp with no "dwell period" to assist the curing of the test material. The test can be carried out at three levels of saturation; 60%, 80%, and 95%. Kiesol C passed even when subjected to the most extreme test at 95% saturation proving its high performance even in the toughest conditions. Explore our full range of damp proofing products or view our treatment options for rising damp. Our advice post contains more information on identifying and treating rising damp . 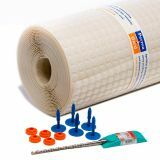 For installation tips read our Guide to Using Damp Proofing Cream to Treat Rising Damp - it takes you through all you need to know including common mistakes around using a diy dpc injection kit. Speak to our technical experts. Whether you're a seasoned Pro or a DIY enthusiast, let us help you with our handy tips, help and advice. Permagard is a leading manufacturer and supplier of basement waterproofing products, damp proofing membranes, and structural repair products. 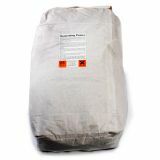 We are official distribution partners for Remmers as well as major stockists of Newton Membranes. You've just added of the product to your cart.